Inspired By Elle features a luxury fashion silk bolero scarf, which is versatile and stylish. Currently available in two designs, each scarf tells a story through art and is truly unique. 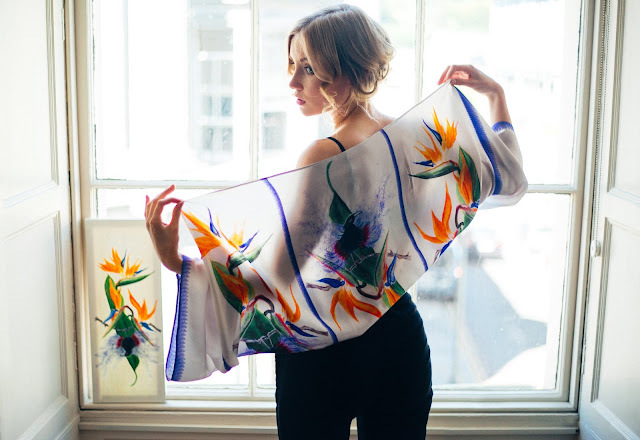 You will have something which others will envy, as these scarves are crafted in silk to create an item suitable all year round, from in the office, to events and on the beach. This scarf is made from mulberry silk, which is natural, but moreover the way in which it is weaved makes it strong with a luxurious feel against the skin. It will keep you warm in the winter and cool in the summer. Equally, as it’s natural it will be great if you have allergies. Whether you buy one for yourself, or as a gift, the person receiving this scarf will be extremely impressed as it comes in a beautiful white handmade box that is embossed in silver.